UNVAILING OF THE WAKING DEAD! Well, the wrap is finally done. The trailer is getting a full restore in the next two weeks. If there is any interest in a thread, I will do one. Lemme know. Going with black and red U-raptor truck bed liner for the trailer and haven't decided on the rims yet. Season is already on us so going to wait til the end of the season to tackle the inside, but when end of season hits, I'm doing a floor up restoration and will do a thread if there is interest. Let me know what you think. I know it's an old school boat and there may be some that think I should have stuck with a more traditional look, but I was going for a concept boat and I think I acheived it! Any comments or criticisms are welcome. Please do some work on the teak shortly after the trailer. I refinished it about a year ago, so a light sanding and some teak oil should bring it back to respectable. In the name of all that is holy, make it so!! My eyes!!! Congrats on the boat! It looks good and you should post some more pictures when you get out on the water. I believe there are some good threads on here of floors getting redone you could use those for reference when you do your floor. LOL! Sitting in my garage laughing my a** off! Dude that looks great!!! Love the walking dead theme!!! I will post better pics soon the current pictures don't it justice, but Lotta more mods to come in the next year. How much to take the wrap off? I like the classic look WAY better. Looks nice! 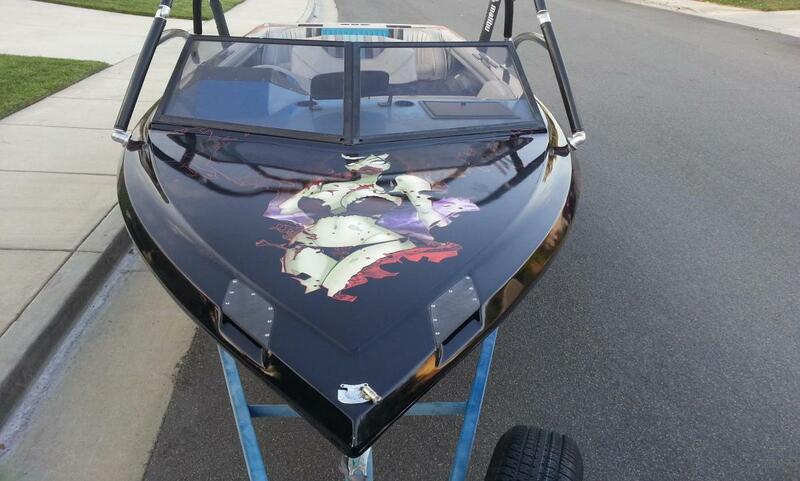 Sure makes it look like a newer boat. Makes me want to paint or wrap mine. 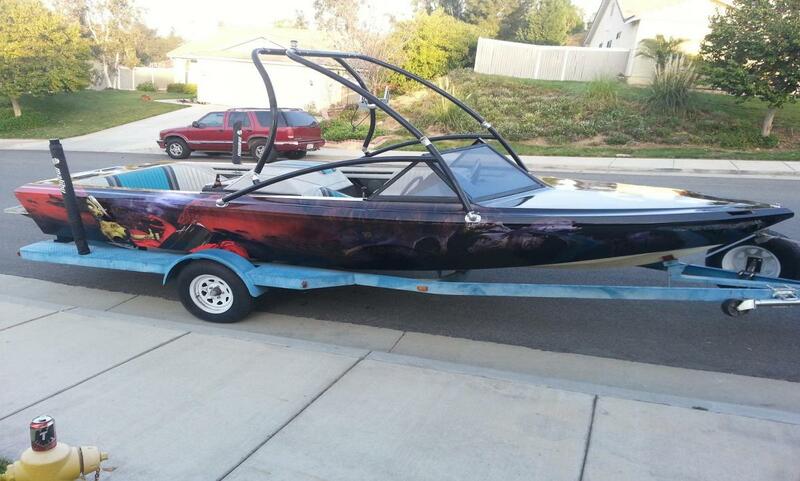 That looks really good, nice to see a wrap that isn't so busy, with a giant Malibu or Wakesetter plastered on the side. I do think that when the windows are tinted (limo) and the trailer is done, as well as the teak, that will really step it up a notch. Good idea with the closed bow graphic, it looks sweet. 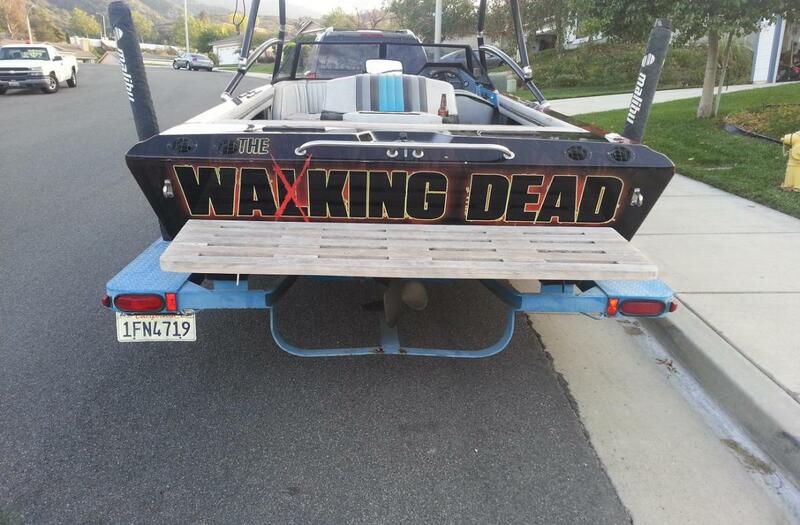 I love the name on the transom, you thought it all out perfectly. Thanks for the support. Trailer restoration thread to come and then updated, hopefully better pics with and without swim deck. And yes, I will do the work on it first. 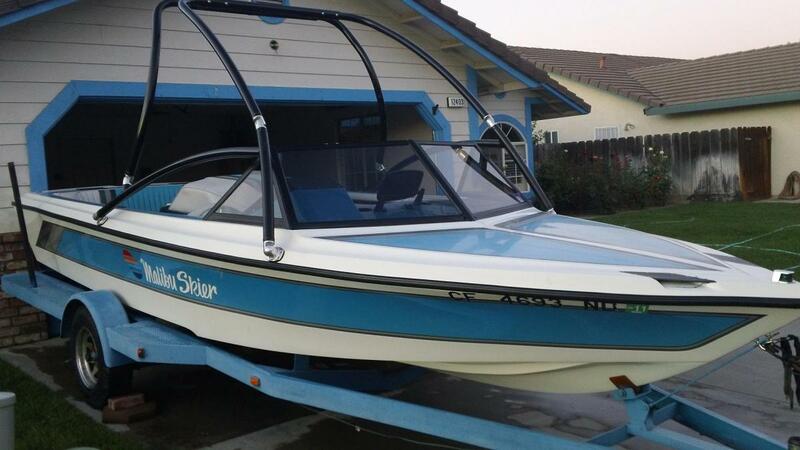 In my defense on the swim deck, I did restore it when I first got the boat (some yahoo spray painted it black!) It looked horrible. But I didn't have my own place to keep the boat, so it kind of got a bit weathered over the last year. 1 hour of elbow grease and it will be back to new. What did the wrap cost you, If you don't mind?